Kid Galahad is waiting on news of a trip abroad that could transport him to one step away from a world title opportunity. The Sheffield super-bantam wants to mirror his gym pal Kell Brook’s champion status. 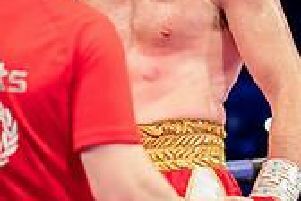 And he has revealed his manager John Ingle is working on a deal to fight abroad in a title eliminator. Galahad also had praise for Adam Etches, who competes on the Brook undercard at Sheffield Arena on March 28. * Frankie Gavin has signed a promotional deal with Matchroom Boxing and will fight under Eddie Hearn for the first time on the Brook undercard.